As a Southern California native, I have a huge appetite for authentic homemade Mexican food. Since moving across the country a few years ago, this has become one of the things I miss the most about the Golden Coast. Whenever I do visit, one thing I make sure to indulge in are San Felipe style fish tacos! 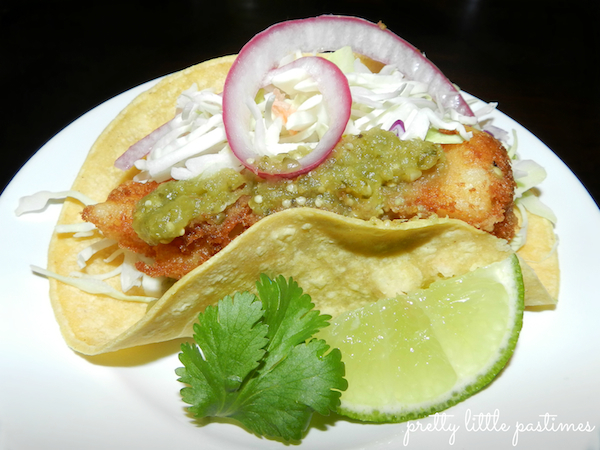 I wanted to share my recipe for Beer Battered Fish Tacos with Tomatillo Salsa. These tacos definitely help curb my craving until my next trip. Place tomatillos, onion, garlic, chilies, cilantro, oregano, cumin, pepper, and salt into a blender. Blend together until smooth. Transfer the puree into a saucepan. Add the chicken bullion cube (optional) and lime juice and bring to boil. Once boiling, lower the heat and let simmer for 15 minutes. Remove from heat and let cool. I put mine in the refrigerator to serve cold with the tacos. *Please note when using two full serrano chilies with seeds, your salsa will be hot. Modify the recipe with less serrano or a more mild chili if you prefer a mild-medium salsa. Begin by combining all of the dry ingredients with the softened butter. Add 1 cup of beer and mix by hand. Continue to add beer until you have a thick batter. Whip the egg whites until just stiff and fold into the batter. Next, cut your cod fillets to desired size. I cut them down the middle and across to get four pieces from each fillet. Heat the oil to 350 degrees. Once the oil is ready, take the cod fillet and lightly dip it into plain flour (to absorb extra moisture and to help the breading adhere) and then into the batter. “Swim” the fish into the oil and cook until golden brown, about 3 minutes. Transfer the cooked fish to a paper towel lined plate until serving. To build the taco, I heated a corn tortilla, and placed the fish inside. I topped the taco with shredded cabbage, tomatillo salsa, red onions, and a simple guacamole (check back for the recipe). I garnished the plate with a lime wedge and cilantro and served it with Spanish rice. Hope you enjoy this South of the Border Pretty Little Pastime!